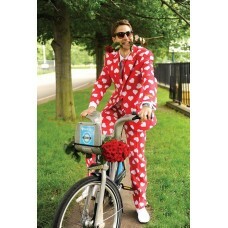 Mr Lover Lover Valentines mens suit & tie. Perfect for Valentine's Day bar crawls or simply showing your affection any day of the year, this suit will grab everyone's attention, most importantly the one you care about the most! Jacket, trousers, tie. Slim fit design. Machine washable fabric. 100% polyester.